Ships from and sold by Sleep Solutions Australia. 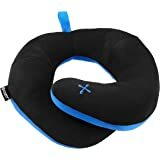 WALL STREET JOURNAL "Best Travel Pillow! 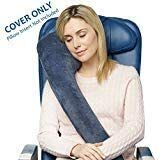 It makes 11 hours in a 17-inch-wide seat more bearable"
Due to health and hygiene considerations we do not allow returns on this product. If there is a manufacturing defect, the product is faulty or the incorrect product is shipped we will provide a refund or arrange to ship you a replacement product. It's good one. You just need to know how to use it. 5.0 out of 5 starsLove it! Been around the world with me! 348 people found this helpful. I am embarrassed that it has taken me two years to write this review but at least I'm finally doing it. This pillow is a great item and the company really stands behind it. I recommend the pillow and the company highly. I used the pillow and cover on a trip from California to Europe a couple years ago. 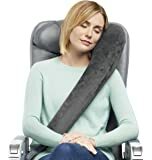 It truly helped me sleep on the plane, which I'd never been able to do before. 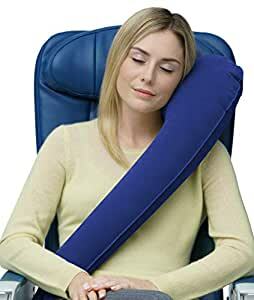 It took me a little time to figure out the best way to place the pillow on my body but once I did, it was a delight to use. Ever since, I have not traveled a distance by plane without the pillow. Sometime after I returned from Europe, I broke the stopper that holds the air in. I contacted the company to see if there was a replacement option and the company sent me a brand new pillow (which had an improved stopper). The company had no obligation to replace the pillow. It made a business decision to have good customer service, which is an indication of a quality company. I'm glad I have this pillow and know you will be, too. When I first saw this pillow I knew I HAD to have it. That was back in 2015....After buying my 4h new pillow I can no longer say I am as in love with it as I once was. I travel often for work and use the pillow pretty regularly. After a couple months of use, the pillow just seems to stop working. It does not stay inflated at all even on a quick 90 min flight. 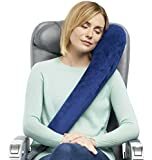 I tried making sure the seal was completely tight every single time I inflated it, and still I would wake up mid-flight with a completely deflated pillow. 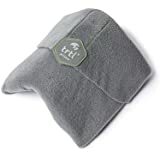 The pillow is fantastic at first and seems like it would be perfect for those who travel less frequently and just need it for 1 or 2 long trips. Takes up no space at all and is easy to use. Just wish I could get it last longer than a few months. 5.0 out of 5 starsA must-buy for frequent long-haul travelers! Ok, I took my time writing this review because I wanted to test the TravelRest out properly. I travel very often and cannot sleep AT ALL on the go (planes, trains, buses..everywhere). 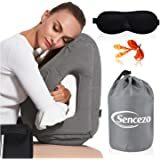 So out of desperation I have tried the various U shaped pillow, leaning against my bf, the seat head flaps, the window, curling up in a little ball (i'm quite small so i can do this) - and nothing worked (mainly because when I sleep my whole body collapses into jello). 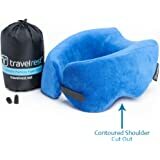 After much research I purchased the TravelRest based on the good feedback and it made the most amount of sense: I lay on my pillow, I can lean on this product. Sold. Let me tell you, its worth every penny. Ignore anyone who says it looks funny or that you will be embarrassed inflating it. It takes 2 breaths and though it is a bit bulky when inflated, you won't notice when you are unconsciously sleeping in bliss. You can tie it to the seat or use it like a messenger bag, it is even nice against your significant other's shoulder. 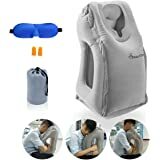 It really relieves the pressure on my neck and allowed my body to relax - Finally! 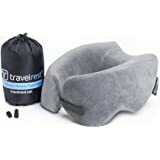 I took 2 flights over 10 hours each that I fly regularly and the TravelRest made these trips a million times better. I now no longer fear flying coach! I also purchased the special pillow case that goes with it, which I also recommend. 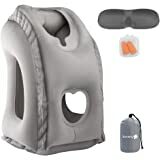 It packs a little larger however its a great feel and does make a difference especially on the seams of the pillow. In the perfect world I would fix the anchor of the strap at the top. 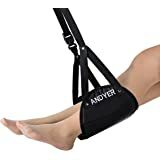 It uses a little plastic pinch device where you can adjust the length of the cord, however once you put weight on the pillow this never stays in place. So I usually wrap the cord around it self and make a light knot so it will hold my head without loosing slack. I'd prefer something where I didn't have to tie it - I get nervous tying the cord, worried that I won't be able to un-tie it in a hurry. Additionally; customer service is amazing! Thanks so much to the helpful staff who make sure I had a great product in a hurry for my travels. They answered all questions and issues I had quickly and professionally. I can't recommend this pillow enough - not only is it well made but the company cares about your experience. Don't hesitate and buy this product!